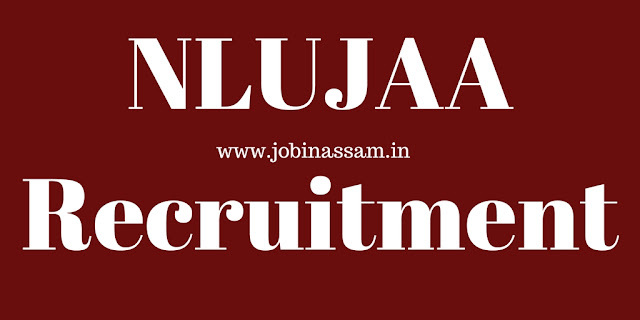 You can apply for National Law University and Judicial Academy, Assam (NLUJAA) Recruitment 2018 for various posts. The details of the posts is below. NLUJAA has invites eligible and interested applications for the following Regular faculty positions in Law. For Hojai College Recruitment Of Assistant Professor check this post too. I have discussed the eligibility criteria and application process in the next paragraphs. National Law University and Judicial Academy, Assam invites applications from the eligible candidates to recruit in the following posts. Total vacancy is 08. An eminent scholar with Ph.D. qualification(s) in the concerned/allied/relevant discipline and published work of high quality actively engaged in research with evidence of published work with a minimum of 10 publications as books and/or research / policy papers. A minimum of ten years’ experience in University / College, and /or experience in research at the University / National level institutions / industries, including experience of guiding candidates for research at doctoral level. A minimum score as stipulated in the Academic Performance Indicator (API) based Performance Based Appraisal System (PBAS). An outstanding professional, with an exceptional accomplishment established reputation in the relevant field, who has made significant contribution to the knowledge in the concerned / allied / relevant discipline, to be substantiated by credentials. Good academic record with a Ph.D. Degree in the concerned / allied / relevant disciplines. A Master’s degree in Law with at least 55% of marks / 50% of marks for SC / ST candidates (or an equivalent grade in a point scale wherever grading system is followed). A minimum of eight years’ experience of teaching and/or research in an academic/research position equivalent to that of Assistant Professor in a University/ College or Accredited Research Institution/ Industry excluding the period of Ph.D. research with evidence of published work and a minimum of 5 publications as books and / or research / policy papers. Contribution to educational innovation, design of new curricula and courses, and technology-mediated teaching/learning process with evidence of having guided doctoral candidates and research students, as evidenced by Ph.D. thesis / co- authored books / publications in peer reviewed journals. Good academic record with at least 55% marks / 50% marks for SC/ST candidates (or an equivalent grade in a point scale wherever grading system is followed at the Master’s Degree level in a relevant subject from an Indian University, or an equivalent degree from an accredited foreign university. The candidate should have cleared National Eligibility Test (NET) / Ph.D. Degree in accordance with the University Grants Commission (Minimum Standards and Procedure for award of Ph.D. Degree) Regulations, 2009. Process of Application- Eligible candidates application form can be submitted along with demand draft to the Registrar, National Law University and Judicial Academy, Assam. You can download NLJUAA Job Application form from here. Examination Fee- You should pay a DD of Rs. 2000/- in case of General category and Rs. 1500/- in case of SC/ST,PC categories for "The Registrar, National Law University and Judicial Academy, Assam", payable at Guwahati. Last Date to Apply- Last Date for Receipt of Application: 19-01-2018. Stages of Examination- There will be a two stages selection process fopr the above mentioned jobs under NLUJA. You should attend the selection process on the prescribed date with all the original documents. Exam Centers- Exam center is the address of the recruiter mentioned above. Exam Dates- Please visit this page after some days to know the interview date of Professor, Associate Professor and Assistant Professor in the campus of NLUJA, Assam at Amingaon, Guwahati. I have shared all the important knowledge for the upcoming National Law University and Judicial Academy, Assam Recruitment 2018 Recruitment here. These Professor jobs will be a good job for you if you are eligible for the post mentioned above, apply before the last date. Monthly pay for the Professor, Associate Professor and Assistant Professor in the campus of NLUJA, Assam job is also good.